A quintessential New England meal, boiled dinners are time-consuming and often reserved for a once-a-week family gathering or holiday meal. Root vegetables are boiled and served with sliced Corned Beef. The Corned Beef requires several more hours of boiling than the vegetables, so if making both recipes in the same night, start with the beef and plan to begin the vegetable preparation when an hour or so remains on the beef boiling. Leftovers from this meal can be used to make Corned Beef Hash or Red Flannel Hash. Preheat the oven to 400-degrees F. Wash beets and place together on a large sheet of aluminum foil. Pour olive oil over beets. Wrap foil around beets to close. Roast beets for one hour or until done. While beets roast, prepare the remaining vegetables. To test the beets for doneness, remove from oven, open foil package, and pierce beet with a fork. The fork should enter the beet easily and the skin should break away. Once beets are sufficiently roasted, remove package from oven and let cool slightly, until beets can be handled. Rub the beet skin away from the vegetable, skin should come off easily. A vegetable peeler can also be used to clean the beets. Slice beets in half and wrap in foil to keep warm until the rest of the meal is ready to serve. Peel and slice the turnips, approximately 3/4-inch thick, and put aside. Peel the carrots and cut into 3-inch lengths and put aside. Wash the cabbage and remove any browned outer leaves. Cut cabbage into quarters and core then set aside. Peel the potatoes and cut in half horizontally. Because of their different cooking times, each vegetables is boiled separately until tender. To flavor the vegetable cooking water, approximately 1 to 2 cups of the cooking liquid from the corned beef is added with a little salt. Add fresh water back to the beef as needed to keep covered. The potatoes need to cook the longest, followed by the turnip, carrots and cabbage. 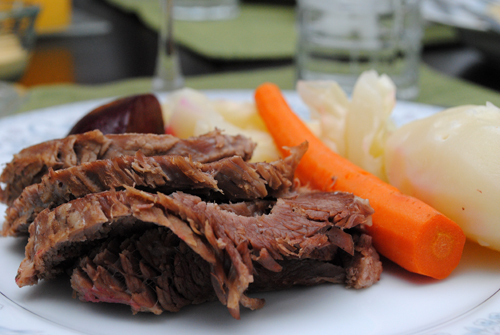 Divide the boiled vegetables and roasted beets among six plates and serve with sliced Corned Beef.